The AmritsarOnline Parivar , welcomes you all on your visit to this unique website, once you will know about this city then it will be your dream to see this place. 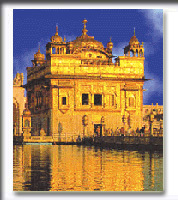 The Golden Temple is sanctum and sanctorum place, the gift of Sikh Guru's to this world. Come and sit in the sanctum sanctorum and feel the mental calmness. Enjoy this E-visit. Copyright © 2001-2011 AmritsarWiz.Com . All rights reserved.